Heart shaped Linzer Cookies filled with raspberry jam say "I (heart) Mom." Heat oven to 350 degrees Fahrenheit. Spread almonds out on a baking sheet, and toast until golden brown, about 5 minutes. Allow nuts to cool completely. Whisk flour, cinnamon, salt, and lemon zest together. Cream butter and 1/2 cup sugar then add the vanilla and egg yolks and mix until combined. Stir in the almonds and mix thoroughly. Remove half the dough from the bowl, flatten into a disc, wrap in plastic wrap and refrigerate. Repeat with remaining dough. Dust work surface with some flour. Roll cookie dough out to 1/4 inch thickness. Cut using a 5 or 6 inch heart shaped cookie cutter. Move cookies to a parchment lined baking sheet. 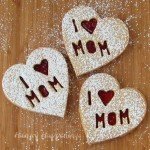 Use small cookie cutters to cut out “I (heart) Mom” into half of the cookies. Bake for about 15 minutes. The edges of the cookies should just turn lightly golden brown. Allow the cookies to cool completely, then dust the “I (heart) MOM” cookies with powdered sugar. Spread raspberry jam on the remaining cookies. Place one cut-out cookie on top of the jam and gently sandwich the cookies together.